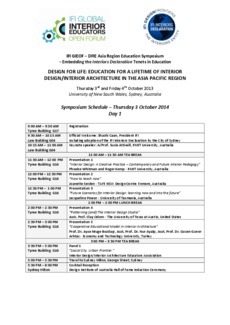 As interior design educators it is critical to not only consider the learning of students within an institutional environment, but more importantly how we can prepare these students to be life-long learners. How can teaching pedagogy implemented now, resonate into the future with our graduates? 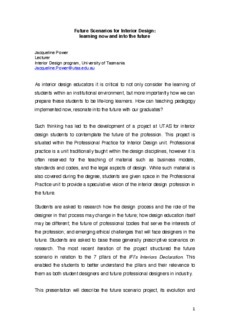 Such thinking has led to the development of a project at UTAS for interior design students to contemplate the future of the profession. This project is situated within the Professional Practice for Interior Design unit. Professional practice is a unit traditionally taught within the design disciplines, however it is often reserved for the teaching of material such as business models, standards and codes, and the legal aspects of design. While such material is also covered during the degree, students are given space in the Professional Practice unit to provide a speculative vision of the interior design profession in the future. Students are asked to research how the design process and the role of the designer in that process may change in the future; how design education itself may be different; the future of professional bodies that serve the interests of the profession; and emerging ethical challenges that will face designers in the future. Students are asked to base these generally prescriptive scenarios on research. The most recent iteration of the project structured the future scenario in relation to the 7 pillars of the IFIʼs Interiors Declaration. This enabled the students to better understand the pillars and their relevance to them as both student designers and future professional designers in industry. This presentation will describe the future scenario project, its evolution and the rationale behind the project. Selected scenarios by students will also be presented.